The United States is home to approximately three million farmworkers who dedicate their days to cultivating crops and harvesting our food. Out of those three million, 72 percent are foreign-born, and almost 70 percent of those people are from Mexico. For the first time since the end of the Great Recession, the Pew Research Center reports more Mexicans are leaving the U.S. than coming here, which growers believe could be contributing to the decrease of farmworkers, along with the ongoing battle about U.S. immigration policies. In 2017, that labor shortage cost the state of California alone more than $13 million when crops started rotting in the fields before they could be picked, and it led some to growers to try to incentivize people with salaries above minimum wage, along with paid time off and 401(k) plans. The average income for an individual farmworker ranges from $12,500 to $14,999, with the average total family income of a farmworker ranging from $17,500 to $19,999, making it the second lowest paid job in the country. According to the National Center of Farmworker Health, about 25 percent of farmworkers are living with total family incomes well under the federal poverty line. In honor of National Farmworker Awareness Week (March 24-31) and Cesar Chavez’s birthday on March 31, we wanted to bring attention to the vital community of farmworkers we all depend on to bring food to our tables. 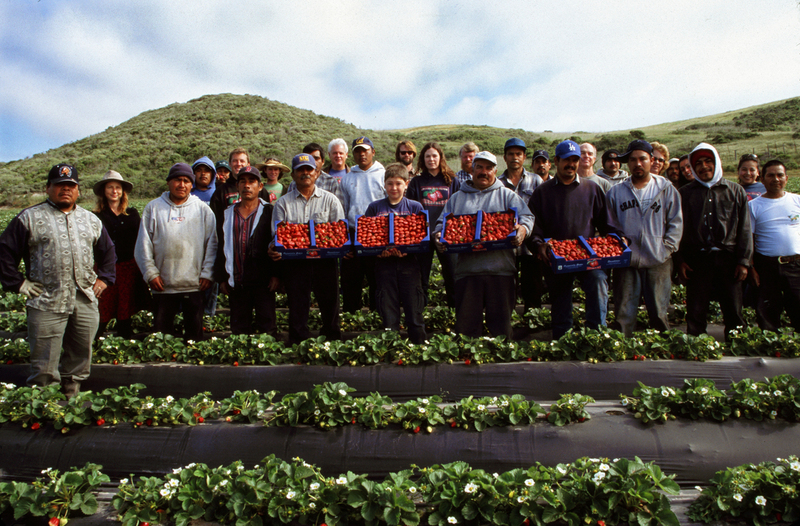 Here are a few organizations and programs that empower and protect our farmworkers. The Agricultural Justice Project was created to provide farms and food businesses with tools to improve work and trade practices from farm to retail. One of the technical tools AJP provides is a certification program for social justice standards called Food Justice Certification (FJC), deemed the “gold standard for labor and trade practices in North America.” In 2014, one of Ferry Plaza Farmers Market sellers, Swanton Berry Farm, became one of four farms in the United States to receive the FJC label, which sets rigorous standards for respectful treatment of farmworkers, living wages, safe working conditions, and collective bargaining rights. Shoppers can find FJC products at their grocery stores, farmers markets, CSAs, and on roadside stands. ALBA’s 100-acre training farm carries out their mission of creating economic opportunity for low-income and aspiring organic farmers. The five-year Farmer Education and Enterprise Development (FEED) program at the Salinas Valley-based facility arms farmers with knowledge on how to launch a farm business, how to grow organic farms, and how to market the produce they grow. ALBA’s two training and educational farms are designed as business incubators. Many of ALBA’s graduates have gone on to run successful farms and CSAs all around the state, such as Sergio Jimenez from Ground Stew Farms (which can be found at the Ferry Plaza and Jack London Square Farmers Markets) and Javier Zamora of JSM Organics (at the Ferry Plaza on Thursdays). Launched in 2011, Alianza Nacional de Campesinas is the first national organization dedicated to empowering women farmworkers to make sure they have a leadership seat at the policy table and to combat violence against women in the fields. The organization inspired the “Time’s Up” initiative after the Monica Ramírez, co-founder and president of Alianza, drafted an open letter in TIME expressing their support for the actresses who were speaking up against sexual assault in the workplace and raising awareness for the conditions and injustices many women farmworkers face each day. Created in 1981 to empower migrant and seasonal farmworkers, Farmworker Justice seeks to help farmworkers improve their own living and working conditions, immigration status, health, occupational safety, and access to justice. Farmworker Justice collaborates with private law firms and legal advocacy organizations to help fight labor abuse of farmworkers and advance farmworker rights. In a recent case, farmworker and health organizations represented by Earthjustice and Farmworker Justice filed suit against the U.S. Environmental Protection Agency administrator Scott Pruitt for delaying for a year implementation of the revised Certification of Pesticide Applicators (CPA) rule, which would have protected minors from continuing to handle some of the most toxic pesticides in agricultural, commercial, and residential settings. Created by Cesar Chavez, Dolores Huerta, and Gilbert Padilla in 1962, UFW has grown to be a powerhouse for organizing farmworkers and advocating for their rights. It originated from the merger of two workers’ rights organizations, the National Farm Workers Association (NFWA) led by Dolores Huerta and Cesar Chavez, and the Agricultural Workers Organizing Committee (AWOC) led by organizer Larry Itliong, and it brought national attention to the farmworker cause in the 1960s leading to several union contracts in states across the country. UFW’s mission is to provide resources to not just to farmworkers but also other working people and to promote a fair and just food supply. UFW sponsors legislation that advocates for farmworkers and runs campaigns to protect the labor force. Take action to raise awareness and protect farmworkers this National Farmworker Awareness Week at Student Action with Farmworkers. Photo of workers by Swanton Berry Farm.